Waldorf Racing Stables' Follow the Dog rated in the clear on the outside of longshot leader Lippi Lorenzo before taking over once straightened for home and pulling clear through the stretch for a 3 ¼-length victory in Saturday's $100,000 Maryland Million Nursery at Laurel Park. The Nursery for 2-year-olds and $100,000 Lassie for 2-year-old fillies, both at six furlongs, were among seven stakes and four starter stakes that helped comprise the 33rd Jim McKay Maryland Million Day program, the groundbreaking concept named for the late Hall of Fame broadcaster that debuted in 1986. Ridden by Julian Pimentel for trainer Marya Montoya, Follow the Dog ($9.60) completed the distance in 1:10.14 over a fast main track. It was the second win of the day and 13th in Maryland Million competition for Pimentel, and first for Parx-based Montoya. Follow the Dog ran second in a pair of maiden special weights at Laurel, the latter Sept. 14, when he was placed first after having to steady in the stretch. He returned to be a well-beaten fourth in an open allowance Oct. 1 at Parx, after which Montoya decided to make a change of equipment that made the difference Saturday. Lippi Lorenzo, sent off at 35-1, was a head in front of Follow the Dog through fractions of 22.45 and 45.67 seconds. Follow the Dog responded when given his cue approaching the quarter pole and quickly opened up on his rivals. Sky Magician was a neck ahead of Outofthepark in a four-way photo finish for second, with Lippi Lorenzo a nose back in fourth and a nose ahead of Known Quantity. Even-money favorite Scrap Copper stumbled badly at the start and spotted the field several lengths, finishing seventh. Follow the Dog is a gray or roan son of Grade 3 winner Bandbox out of the Cozzene mare Two's Cozy. Montoya said she would consider the $100,000 Maryland Juvenile Futurity for Maryland-bred/sired juveniles going seven furlongs Dec. 8. Euro Stable's My Star Potential, making her stakes debut in her third career start, lived up to her name with a front-running 1 ½-length victory the $100,000 Maryland Million Lassie. Outsprinted from the gate by 50-1 long shot Barbsgray Lion, My Star Potential ($6.60) quickly gained ground along the rail to gain a short lead after going the first quarter-mile in 22.28 seconds. Jockey Jomar Torres let the Tritap filly roll through a half in 46.10, turned for home in command after five furlongs in 58.53 and was never threatened to hit the wire in 1:11.73. Belial, 9-5 favorite My Philly Dilly and Knock Out Kid were separated by a neck for the next three spots. The win was the second for My Star Potential, trained by Laurel fall meet leader Claudio Gonzalez. 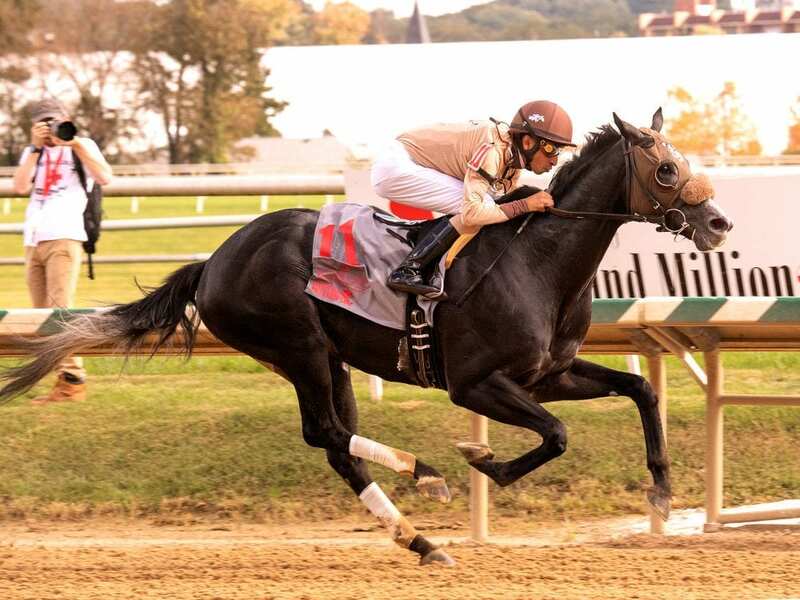 She debuted with a three-quarter-length maiden triumph Sept. 2 at Timonium and overcame an awkward start to be beaten a nose in an open entry-level allowance going six furlongs Oct. 1 at Parx. Bred in Maryland, My Star Potential is out of the Cuvee mare Cheers Darling and fetched $50,000 as a 2-year-old in training in May. This entry was posted in Racing and tagged Claudio Gonzalez, follow the dog, Jim McKay, Jomar Torres, julian pimentel, laurel, laurel park, lippi lorenzo, marya montoya, Maryland Million, maryland million lassie, maryland million nursery by Press Release. Bookmark the permalink.